As I rechecked my camera pack in preparation to leave for the garage at 7:30am this morning, my cell phone rang. “Looks like one of the prison chicks went down. A bird monitor picked her up in the alley between the garage and the EPA building very early this morning and has her in a box at her house. Where are you?” Mary Hennen asked, sounding cheery. “I was just walking out the door on the way to the garage,” I said. “Roger-roger,” I said, clicking my phone shut. I hustled over to the garage and punched “12”, having made arrangements to meet Mary on the roof. Looking over at the nest, I saw only one bird – the last, slow female who took so long to come out in the first place – perched on the ledge. Male fledged on Monday. Female fledged today. 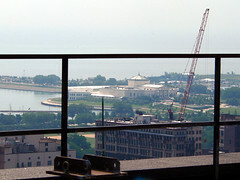 Female on the ledge. Hmmm. Say…where’s the other female? As I mulled that over, Mary pulled up behind me. I threw my stuff in her car and we commenced with mission “Rendezvous Wendy”. Rush hour foot traffic crowded the corner of LaSalle and Clark and Mary and I watched the activity while casually leaning up against the wall of the EPA building. Wendy showed up maybe ten minutes later carrying a cardboard file box with a bunch of holes punched in the top. We exchanged greetings. Wendy seemed like a genuinely good person from the start as she gave a succinct recitation of our little boxed falcon’s morning, behavior and health, all the while gently cradling the box in her arms. Mary promised we would call as soon as we finished at the vet, took the box and bid farewell. The vet visit very much resembled our last vet visit, including an all-clear for the chick! Huzzah! Mary called Dan from the EPA to arrange the chicks release from their roof and then Wendy, who was quite happy to hear that the chick was just fine. Mary invited Wendy over to watch the release. When we arrived at the EPA building lobby, Dan waved at us from behind the security checkpoint. Much confusion ensued as Dan came through security and took the chick in the box around while Mary and I sent our three thousand bags with all sorts of odd tools and items inside through on the x-ray conveyor belt. After explaining some of the items, we finally made it through security and joined Dan, who was standing with a large group of people, including Wendy! We? Banding? I took a quick look around, expecting to see Chris from the USFWS or Matt from the Shedd. No Matt. No Chris. “We” as in me? Wow. Yesterday, someone had a fortune cookie left over from lunch and gave it to me: “Luck will come your way soon. Enjoy every minute.” I intended to! Let’s go, Luck! We’re going to band a chick! With the chick’s ever-growing entourage in tow, we found the conference room and set up quickly. I tried very hard to look calm, reassuring and as if I’d done this a thousand times. I made a mental note to do everything in my power not to embarrass myself, Mary or the venerable institution where we are both so lucky to work. I handed my camera to one of the very nice people packed into the conference room and showed her how to start the movie. Mary has done this so many times, a great deal of those times in front of television cameras, other media outlets and crowds, that she seemed super-relaxed. I tried not to think about how many people might be about to witness me doing something stupid. Mary pulled the chick from the box and laid her down on a towel, where I smoothly tucked her wings while putting the towel over her head then hugged my arms in on both sides of her to keep her still and secure. Mary quietly instructed me to hold the base of her legs, which I did. 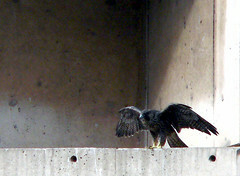 The chick stopped squawking as soon as the towel went over her head, but she still struggled and man, she was strong. I had her bitey bits beneath the towel and secured, but still, I could see she was trying to get her impressive beak near anything that might bleed. By the by, I really only know all this because I watched the video. I was so overexcited during the actual event, I don’t remember much of it. Watching the video with Sean later that night, he commented that I seemed completely relaxed. I did! Even when the chick somehow Houdini’d her head out from under the towel and latched onto my hand, my camera self just chuckled softly and flicked her hand away quickly before re-securing the head. It was nearly unnoticeable. I thanked myself for not publicly uttering the very colorful epithet that cruised through my mind as I surreptitiously unhooked her beak from the small pinch of skin below my thumb. And so soon, it was over. 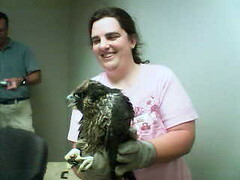 I let go of the towel and Mary held a very disgruntled and ruffled Wendy (the bird, of course) up for pictures. Afterward, the entourage, totaling I couldn’t even guess how many people, followed Dan down the hall to the service elevator where the building manager waited. We rode to the roof access floor stuffed together uncomfortably, but arrived quickly. The view was incredible. Mary and I scouted the perimeters and the air for any angry parents and then Mary took MCC Wendy away from the crowd and extracted her from the carrier before backing quickly away to rejoin the human crowd. Wendy seemed disoriented for about one minute then calmed. She ruffled her feathers indignantly and shook her foot before spreading her wings to flap-hop-flap a few feet across the roof. She scored a round of “awwwwwwww”s from the crowd when she diligently used her impressive beak to try to pry her new leg bands off of her leg. At long last, the time came to leave Wendy (falcon) in peace. Mary, Wendy (human) and I exchanged ‘thanks’ and ‘goodbyes’ with Dan & co. and headed on down to the lobby. As we prepared to part company, Wendy asked if either Mary or I could stop by her place and pick up some dead birds she’d found and stored for the museum. I volunteered and took off with Wendy while Mary went in to the museum. Wendy lived a few blocks away (in fact, about 3 blocks from where I live) in a very cool turn-of-the-century building. Formerly, the building housed offices and years ago, renovators retained this look by using all the original glass doors – complete with the stenciled business names and addresses – as the fronts for the residential doors. I felt like I’d just walked in to a Bogart & Bacall film noir. Very, very cool. As Wendy retrieved the “birdcicles” from her freezer, I skritched her two cute cats and we chatted about the rescue. Hopefully, Wendy will send me the story in her own words, but in a nutshell, here is what happened. As a bird monitor, Wendy goes out every morning at the crack of dawn to patrol the streets and alleyways for two blocks around her house. As she walked down the narrow alleyway between the garage and the EPA building (the same alleyway I was in when I retrieved the bat long ago), she saw a form huddled near the wall. Delivery trucks were already starting to pull down the alleyway and Wendy stopped progress while she assessed the situation. Realizing that it was a falcon, probably a baby, she knew she wasn’t going to have time to run home and get a pet carrier. So, she took off her jacket, threw it over the chick and picked her up with her bare hands, deftly keeping out of the way of talons and beak. With the baby falcon biting and struggling in hand her arms, Wendy hurried home as fast as she could. When she got to her elevator, she struggled to retrieve her elevator key from her pocket and the chick’s wings got free – wings which span about 3 feet. I’m not sure how Wendy managed to do all of this, but was even more impressed to find out she did it without heavy leather gloves. I silently promised myself that I’d do everything I could so that K/40’s name would be “Wendy” (and, as it turned out, I was able to do so). I congratulated Wendy the rescuer, thanked her again profusely and promised to keep in touch. Little did I know, I’d be calling her back the very next day. “I am almost at the bus stop on State, headed into the museum,” I responded. Dr. B. is Dr. J.B. Bruederle of the Burnham Park Animal Hospital in the South Loop. Our cats started going to Dr. B. when we moved to the south loop in 1998. I’d never have taken them to anyone else. Dr. B. is a phenomenal vet and also a friend. So, I felt pretty tickled he had one of our chicks. I briskly walked the 6 blocks south from the State street bus stop to Burnham Park Animal Hospital, beating Mary. The last time I’d seen Dr. B., it had been a sad day for all of us. When I showed up out of the blue that morning, Dr. B. blinked at me in confusion, trying, I’m sure, to figure out why I was there. 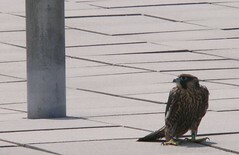 After I cleared things up, he took me back to see the second falcon chick. She glared out at me from inside a large dog carrier, but seemed, by first glance, just fine and dandy. Dr. B. concurred and we discussed falcons while waiting for Mary. When Mary got there, Dr. B. generously loaned us an exam room and he and an assistant took a look at the chick before we banded her. Beth the falcon (named, by the by, for Dr. B.’s wife Beth) checked out fine! We banded her and called Dan. Same song, second verse as we let Beth out on the roof. She stalked around, perking when her sister Wendy, who was perched on the north-east side of the building, let out a piercing cry. As we left, I peeked around the corner to see Beth hop-flapping over towards her sister. It amazes me how many people band together during situations such as these. Although humans can be an absolute menace to the animal world, both of these chicks have many kind-hearted souls to thank for their health and welfare. And I am thankful I have so many new, kind-hearted, friends. Tonight, as the last of the sunlight slips from the sky, I can see the sisters on top of the EPA building. Well, really just their silhouettes, but my spotting scope lends some nice detail. They are sitting so close together, they look like one fat bird with two heads. 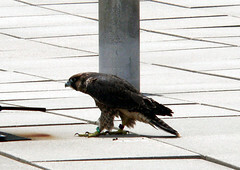 One of the chicks has just started grooming the feathers on the back of the other chick’s neck. By the fluffy shape of the shadow, I can see that they are fluffed out and sitting down on their feet in typical roosting position. Sleep well, girls! ~ by Steph on June 16, 2006.